Berlin is squandering the biggest windfall in a generation. Its annual budget surplus will be north of 20 bln euros both in 2015 and 2016, think tanks predict. Angela Merkel favours debt reduction over plugging the chronic investment gap. This can only harm long-term growth. 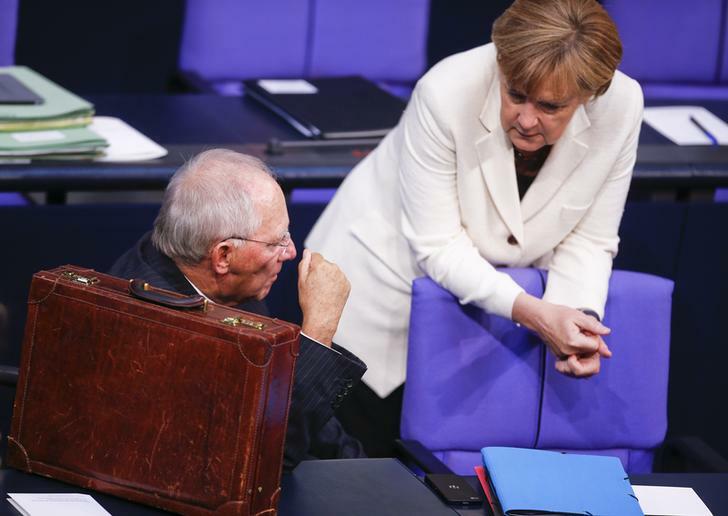 German Finance Minister Wolfgang Schaeuble speaks with Chancellor Angela Merkel during the budget debate in the Bundestag, the lower house of parliament, in Berlin, September 10, 2014. Germany’s leading economic think tanks have almost doubled their 2015 growth forecast for Europe’s largest economy. In the Joint Economic Forecast report, published on April 16, the researchers expect real GDP to grow by 2.1 percent, up from just 1.2 percent in their October 2014 forecast. In 2016, growth is seen at 1.8 percent. Domestic consumption, fuelled by rising real wages, a strong labour market and cheap oil, is going to be the main driver of the recovery. Imports are expected to grow at faster rates than exports in both years, but the country’s nominal trade surplus is nonetheless expected to rise from 189 billion euros in 2014 to 232 billion euros in 2016. The strong recovery will boost tax revenue and lower social security expenditures. The state’s budgetary surplus is expected to rise from 18 billion euros last year to 21 billion euros in 2015 and 26 billion euros in 2016. This accounts for a structural budgetary surplus of 0.7 percent of GDP this year and 0.8 percent next year.